With gas prices on the rise again, destinations close to home become ever more appealing for travelers. Located within a day&apos;s drive of half the nation&apos;s population, the Roanoke Valley offers unique attractions and endless outdoor recreation. Touted as the "capital of the Blue Ridge," Roanoke has a vibrant downtown district that is highlighted by its railroad heritage, eclectic art and architecture, and historic market square. The city&apos;s hip restaurant scene satisfies every craving, from bistro and elegant steak house fare to Thai and Indian cuisine. "The historic city and surrounding countryside have so much in place that is waiting to be discovered, even by our own residents," said Landon Howard, executive director of Roanoke Valley Convention and Visitors Bureau. "And there is always something new to do with a variety of regional events throughout the year - from Strawberry and Kite Festivals to the popular Blue Ridge Bike Fest." Railroad buffs will delight in Roanoke&apos;s history as a railroad town and manufacturing hub for Norfolk and Western&apos;s steam locomotives. (Norfolk & Western merged with Southern Railway in 1982 to become Norfolk and Southern.) Visitors can delve into rail transport history and climb aboard some classic railcars at the Virginia Transportation Museum, which showcases the largest collection of diesel and steam locomotives in U.S., as well as automobiles, trucks and a rocket. One man&apos;s passion for the steam-powered railway comes alive through his acclaimed collection of artistic photos exhibited at the O. Winston Link Museum. Link&apos;s persistent photographic studies document the last five years of Norfolk and Western&apos;s steam locomotive runs. His passionate work is profiled in an excellent museum video presentation. Roanoke&apos;s architectural masterpiece is the Taubman Museum of Art, opened in 2008. The contemporary building features glass and metals in an angled and curved design - a sculptural tribute to the surrounding Blue Ridge and Appalachian Mountains and the region&apos;s industrial beginnings. Taubman showcases American art, modern, decorative and folk art of regional and national artists. Special spring exhibitions include Quilt Art by international quilters and Hollis Siegler lithographs, titled the Breast Cancer Diaries. The museum offers regular programs including family days, classes and camps. A major draw to Roanoke&apos;s downtown is the City Market, with year-round vendors selling produce, flowers, meats and seasonal products from local farms. The market area includes artisan booths with handcrafted items and specialty boutiques. Operating since 1882, the City Market is the longest continuously running open-air market in Virginia, and has been recognized as a "Great American Public Place" by the Lyndhurst Foundation. The 100-foot-tall Roanoke Star perched on Mill Mountain is the city&apos;s most notable landmark, where visitors can access an overlook to take in panoramic views across the Blue Ridge and Allegheny Mountains. Families enjoy walking on Mill Mountain Park nature trails or a visit to Mill Mountain Zoo, one of few in the nation located on a mountain. Roanoke&apos;s Greenway, popular with walkers, joggers and cyclists, will soon connect more than 20 miles of paved trails, linking together neighborhoods and downtown along the Roanoke River. Rent a bike at Cambria Suites Hotel located on the trail, and you can ride along the river and explore historic Grandin, a 1920&apos;s neighborhood and village with a restored theatre. Stop for ice cream at Pop&apos;s, the ‘best soda fountain in town&apos; for 104 years. Antique lovers will want to browse Grandin&apos;s Black Dog Salvage, a 40,000 square foot warehouse of architectural treasures including mantels, wrought iron, windows, stained glass and one-of-a-kind design items. Outdoor adventurers in the Roanoke Valley will find multiple access points for hiking the Appalachian Trail, cycling the Blue Ridge Parkway or nearby canoeing on the James River. For wine lovers interested in Virginia wines, one of the Commonwealth&apos;s scenic Wine Trails meanders through historic Botetourt County, north of Roanoke. In hilly countryside, the Botetourt Wine Trail leads to three family-run, farm wineries, all within about a 20-30 minute drive apart. Set on hundreds of pastoral acres surrounded by mountain views, the Blue Ridge Vineyard, Virginia Mountain Vineyard, and Fincastle Vineyard & Winery each have a different character and produce some different wines, but all grow their own grapes and use old-world production methods. Visitors can taste a wide selection of wines from light sweet whites to full-bodied reds grown from varietals such as Riesling, Chardonnay, Cabernet Sauvignon and Cabernet Franc. The Botetourt Wine Trail offers an outdoor Summer Concert series at each vineyard and other venues, combining music, wine tasting and specialty foods. The three wineries offer tastings, tours and family events throughout the year, which include live music with local bands, theme parties and lawn picnics. If you go: Roanoke offers a wide choice of accommodations, from the newly renovated contemporary Sheraton Hotel near the mall to the legendary, Tudor-style Hotel Roanoke, as well as several Bed and Breakfasts in historic neighborhoods. 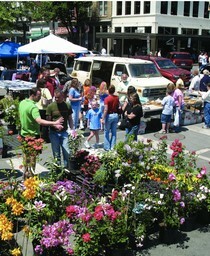 www.visitroanokeva.com; www.botetourt.org.